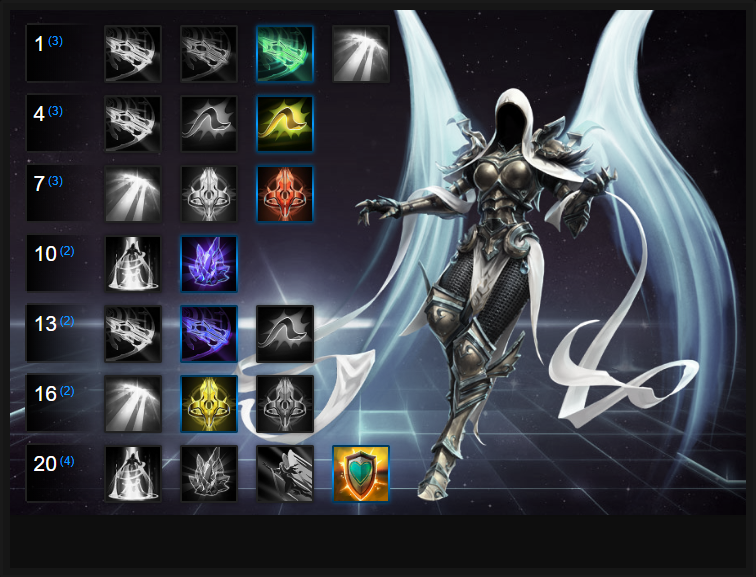 In this Auriel Build Guide, we provide an overview of her strengths, abilities, talents and matchups. Auriel is the newest Support Hero to Heroes of the Storm and I would argue, one that can easily displace Rehgar as the go-to Hero of choice for looking after a team. Unlike other Support Heroes, she has no mana and this places her in a very powerful position. Similar to a Hero such as Sonya, she acquires energy through attacking minions, or enemies and stores it. She can then utilise this to provide healing to her allies. Effectively, as long as she maintain her energy gain she can heal indefinitely. This provides Auriel with unrivalled sustain and in many respects, instantly places her above her peers. Where Rehgar or Lt. Morales can be mana intensive (certainly until level 20) during heavy fights, Auriel doesn't suffer such issues. Despite her sustain, Auriel relies heavily on her team being capable of providing her with energy. She can obtain some from attacking by herself, but her gain is far superior when her trait is used on a high damage Hero. If her team aren't afforded the opportunity to deal damage, she'll struggle to acquire enough energy to repeatedly heal her team. Finally and unsurprisingly based on her kit, she's incredibly vulnerable to crowd control. With no outs, a single root, stun or slow can see her easily focused and killed. Considering the short knockback on Detainment Strike, it's rarely enough to save her if you're out of position. Bestow Hope (Trait) - Effectively replacing her need for mana, Bestow Hope provides a passive gain of energy. 40% of the damage you deal to Heroes and 8% to minions and camps is stored. In addition to this, Bestow Hope can also be cast on an ally and when they are near you, they'll provide a proportional return of energy to you. It's absolutely paramount that you cast Bestow Hope on your highest damage Hero and one that, preferrably, can constantly deal damage. It's particularly effective on Heroes such as Raynor or Illidan who can continually attack during combat allowing you to gain maximum energy return. I should also stress that even with Bestow Hope cast on an ally, you should constantly be attacking. Two sources of energy is far better than one. Sacred Sweep (Q) - Your primary means of clearing minions or striking multiple enemy Heroes at once, Sacred Sweep deals only minor damage but is a valuable way of securing energy quickly. The additional damage to enemies caught in the center is also a valuable tool for increasing your energy gain. I would also add that due to the AOE damage against a minion wave and the fact energy is gained on damage dealt to all units, it's invaluable for quick returns. Detainment Strike (W) - Your only form of defend, Detainment Strike offers a short range knockback that by default can strike only a single target. If the target struck hits terrain, they'll be stuned for 1.5 seconds and take additional damage. While I'd always argue it's much more valuable to aim to hit an enemy into something don't go out of your way to do so. You can't always gaurentee you'll be close enough to terrain to maximize its value. If possible, always try to save this skill until you're focused. Ray of Heaven (E) - As Auriel's only heal, Ray of Heaven has a low cooldown but also consumes all Auriel's energy the moment it's used. There's no deciding how much you want to heal by so it's imperative that you pair your use of Ray of Heaven with your energy. Have a full bar? Don't use Ray of Heaven to heal a team who are barely at 75% health. Instead, save your heal for when you can gain maximum benefit from it. Alternatively, if you've only a little energy feel free to top-up your team. It's also worth noting that Ray of Heaven heals in a relatively large area of effect, making aiming of it fairly generous - just ensure your team group up to benefit from it. Resurrect (R) - I would argue that Resurrect is an underappreciated Heroic. While rarely used and although it does leave Auriel incredibly vulnerable, it has its uses. For 0.5 seconds you have to channel the skill in order to bring a player back from the dead and during that time, you can't do anything else. The period is very brief and as long as your team are defending you however, it can allow you to comfortably snowball against the enemy team during a fight and is ideal if you have a Hero such as Johanna protecting you during its cast. Be aware that you can be interrupted during it - stuns, knockbacks and fears need to be avoided. I've often found it best used on large Battlegrounds where you're less likely to encounter an abundance of players ready to stop you resurrecting. Crystal Aegis (R) - Undoubtedly her more offensive Heroic, Crystal Aegis places an allied Hero in stasis for 2 seconds before it detonates. Once it does, all those surrounding the crystalized player will take reasonably high damage. Its area is also large, making it difficult for enemies to escape if you use it on a Hero that's under heavy fire. What's particularly strong about Crystal Aegis is that all enemy Heroes damaged by its explosion provide a significant amount of energy back to Auriel. Righteous Assault allows Auriel to shave 3 seconds off her Sacred Sweep every time she hits a Hero in the center of her attack. Considering how much Auriel relies on Sacred Sweep for her Energy gain, ensuring it's always available is incredibly important. Repeated Offense significantly increases the damage of Detainment Strike, and affords Auriel with a massive bonus of damage after stunning 6 Heroes. It's easy to complete, grants Auriel plenty of Energy and can soften any Hero almost instantly. Variable: Heavy Burden is a great alternative but it specifically requires you to knock players back into terrain with Detainment Strike in order to slow them by 40% for 3 seconds. The slow is amazing and it's brilliant for ganking a specific Hero. It has much more potential on objective heavy, close quarter Battlegrounds. Auriel can't always rely on other Heroes to give her Energy, so increasing her Energy gain by 100% from basic attacks against Heroes is significant. She can often use basic attacks with ease (without much risk to herself), so Energized Cord is a good talent for ensuring you've always got the Energy you need to heal. Crystal Aegis works similarly to Void Prison and often buys Auriel and her team enough time to shelter an ally, protect them during the Aegis, before healing or peeling for them. It buys a significant amount of time, while also providing area denial. Variable: Ressurect works well on large Battlegrounds as it provides Auriel with an ability to bring allies back from the dead. Its cast time might be long and you'll need protecting during it, but it's amazing for turning a fight around if you do manage to pull it off. Just ensure you ping the skill in chat so your team know you're about to use it. Allowing Auriel to push enemies towards the center of her Sacred Sweep if they're struck by the outer edge, Converging Force allows her to land Detainment Strike easier, while also grouping up enemies. If she does this effectively, her team can punish those caught with heavy AOE fire. Variable: Blinding Flash is a brilliant alternative against just about any composition. Allowing Auriel to prevent basic attack damage for 2 seconds thanks to her Blind from Sacred Sweep ensures she needs to heal less, and her team survive longer. Similar to Abathur's Symbiote upgrade, Will of Heaven increases the attack speed of an ally affected by Bestow Hope by 20%. That's a huge amount and if paired with Raynor, Greymane or Illidan their damage can skyrocket. Variable: If your team is "mage" heavy (such as Gul'dan or Jaina) it's often best to take Wrath of Heaven. It allows you to boost their ability power by 10% - not too shabby. Perhaps a strange talent at first, but Shield of Hope is incredible for reducing your need to cast Ray of Heaven if you don't happen to have enough energy. It grants all allies around Auriel a shield for 3 seconds equivalent to 50% of their missing health. For example, if Muradin was at half health (1278) he would receive a shield for around 640 health. That's a sizeable amount for a group-wide buff. This list of tips and tricks are just a handful of things we think will help your Auriel play. We'll continue to add to the list as required and if you have any tips you'd like to share, let us know in the comments below and we'll place them here. 1. Lunara, Valla, Raynor, Illidan and Greymane all make amazing targets for Bestow Hope. 2. If possible, you should always ensure high value targets are caught in the center for maximum damage to them. 3. Ray of Heaven has a very low cooldown but is best used when your energy is at maximum. You'll get the most bang for your buck. 4. Try to always cast your Trait on an ally doing the most damage. If that isn't a Hero noted in tip one (above) that's fine - you need energy at all times. 5. Never waste your Detainment Strike for poking the enemy. It's your only form of defence. Keep it until someone attacks you. 6. If you can, try to position yourself near terrain so that if an enemy does attack you, you have something to knock them into. 7. You should constantly be attacking and using Sacred Sweep to clear minion waves. Your lack of mana gives you a lot of sustain in lane and allows you to build energy quickly. 8. Ray of Heaven has a fairly large radius. It's hard to miss with but it's important that you heals as many allies as possible. 9. If you need to Resurrect an ally, always make sure you're positioned behind your team mates. If you're at the front, you'll die quickly while in stasis. 10. Positioning is key for Auriel. You have range, but you're incredibly vulnerable. Always be at the back no matter what. 11. Bestow Hope has a very small cooldown (1.5 seconds) - don't be afraid to constantly switch allies who can benefit from its attack speed bonus or which can give you the most energy supply.